It’s almost Super Bowl Sunday and that means football watching, jersey wearing, party hosting and, perhaps more importantly, it means saucy wings, spicy chili, and cool dips. You can get crazy with football foods (like stadiums made out of sub sandwiches? ), but sometimes it’s best to stick with the classics. 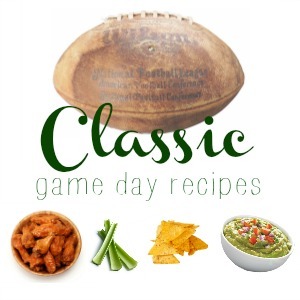 The recipes I’ve picked are for foods that will never go out of style when it comes to football parties. Plus, luckily for all of us, grocery stores know what we want to buy this week, so lots of party supplies are on sale. If you’re looking for chips, hot sauce, or sodas, you can most likely find them at a good price this week (you can use the item search to find out where to get the best deals on the ingredients for your game day recipes). The prices listed are an average price based on what’s on sale this week so you’ll have something to compare to your shopping list for your local grocery store. ground beef – $2.99 lb.